MAA agent Duncan McLeod (right) and Cam Flower of CA Flower & Co, Garrabarra, Roma with a pen of heifers that sold at yesterday’s store sale. The Santa cross heifers sold to 282c/kg, reaching a top of $1,010 to average $878. Cattle numbers rose by 1,509 head to 7,969 at the Roma Store Sale. Cattle were mostly drawn from the local supply area with some lines from Western Queensland NSW and South Australia also. The usual panel of buyers was present and operating. Heavier yearling steers were present in greater numbers this week and the yarding was dominated by steers and heifers. Quality was again mixed, however demand for the better quality lines of cattle remained strong. Light weight yearling steers 200-280kg to restockers fell by 5c/kg. Medium weight yearling steers to domestic feed fell by 3c and medium weight yearling steers to export feed also fell by 5c/kg. Heavy weight yearling steers to feed fell by 10c to 20c/kg. Light weight yearling heifers to restockers rose by 3c, however a large sample of yearling heifers 200-280kg to restockers fell by 5c/kg. Medium weight yearling heifers to feed saw no change. Medium weight 2 score cows rose by 3c, but the medium weight 3 score cows fell by 1c/kg. A fair sample of yearling steers 200-280kg to restockers sold to 318.2c to average 311 c/kg. A good sample of medium weight yearling steers to domestic feed sold to 316.2c to average 308c/kg. Medium weight yearling steers to export feed made to 318.2c to average 308c/kg. A small sample of heavy weight yearling steers to feed sold to 320c to average 316c/kg. A large sample of yearling heifers 200-280kg sold to 272.2c to average 259c/kg. A fair sample of medium weight yearling heifers to feed sold to 282.2c to average 282c/kg. Heavy weight yearling heifers to slaughter sold to 278.2c to average 269c/kg. Medium weight grown steers sold to 298.2c to average 295c, while heavy weight grown steers made to 314.2c to average 313 c/kg. Grown heifers sold to 277.2c to average 265c/kg. Medium weight 2 score cows sold to 229.2c to average 219c, while the 3 score medium weight cows made to 255.2c to average 239c/kg. Heavy weight cows made to 256.2c to average 243 c/kg. The best of the light weight bulls made to 300.2c to average 300c/kg. Weaner steers under 220kg topped at 320c/kg and averaged 269c/kg, weaner steers in the 220-280kg range reached 318c/kg and averaged 286c/kg. Steers in the 280- 350kg range reached 316c/kg and averaged 297c/kg, and steers in the 350-400kg range reached 318c/kg and averaged 302c/kg. Feeder steers in the 400-550kg range topping at 322c/kg and averaging 299c/kg. Cows and calves hit $910/unit. S & T Gilligan, Yarraglen, Brewarrina sold Charolais cross steers to 322c/kg, reaching a top of $1,696 to average $1,133. JS Grazing, Double J, Injune sold Angus steers to 320c/kg, reaching a top of $1,775 to average $1,410. Rob Cornish Electrical Pty Ltd, Riverview, Mitchell sold Charolais steers to 318c/kg, reaching a top of $1,212 to average $1,169. Wellesley Pastoral Co, Wellesley, Surat sold Euro cross steers to 318c/kg, reaching a top of $999 to average $873. JI & LC Noller, Injune sold Charolais cross steers to 318c/kg, reaching a top of $991 to average $899. Bendemere Pastoral Co, Bendemere, Yuleba sold Angus steers to 316c/kg, reaching a top of $1,107 to average $984. AM, JR & KJ Lamb, Cushnie, Taroom sold Angus steers to 314c/kg, reaching a top of $1,282 to average $1,012. Noogilla Cattle Co, Woodlands, Mitchell sold Simbrah steers to 312c/kg, reaching a top of $1,330 to average $1,330. The Simmental cross cows sold to 248c/kg, reaching a top of $1,303 to average $1,153. Dart Pastoral Co, Thirlstone, Roma sold Charolais cross steers to 312c/kg, reaching a top of $1,059 to average $993. Seawright Investments, Comet Downs, Injune sold Santa steers to 310c/kg, reaching a top of $1,178 to average $900. The Santa heifers sold to 265c/kg, reaching a top of $853 to average $758. Ray W Thomas, Burrenbah, Mungindi sold Charolais cross steers to 310c/kg, reaching a top of $1,108 to average $945. 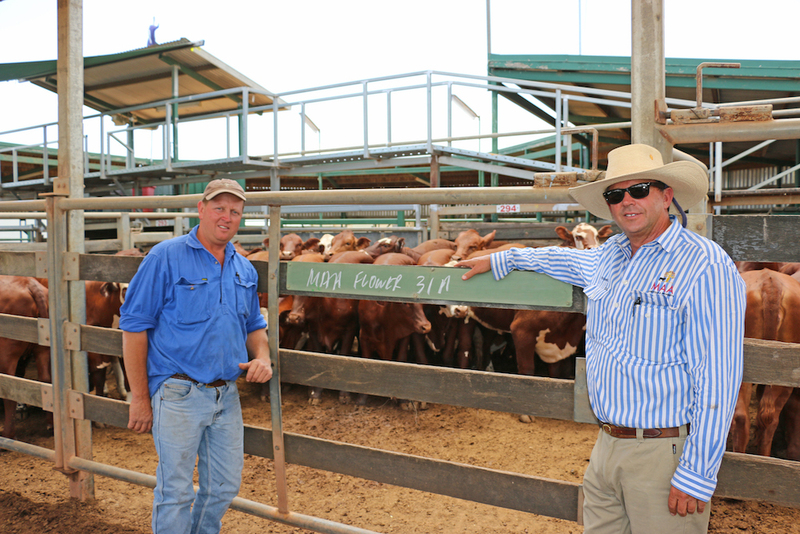 JB Beitz, Washpool, Amby sold Santa cross steers to 308c/kg, reaching a top of $1,171 to average $1,104. DJ & KA McDonald, Wyrapa, Charleville sold Droughtmaster steers to 302c/kg, reaching a top of $752 to average $752. The Droughtmaster heifers sold to 248c/kg, reaching a top of $547 to average $547. Heifers under 220kg topped at 270c/kg and averaged 228c/kg, while heifers in the 220 – 280kg range topped at 272c/kg and averaged 243c/kg. Heifers in the 280- 350kg range topped at 282c/kg, averaging 264c/kg. Heifers in the 350-450kg range topped at 280c/kg, averaging 267c/kg. CA Flower & Co, Garrabarra, Roma sold Santa cross heifers to 282c/kg, reaching a top of $1,010 to average $878. TM Dawes, Barr Park, Roma sold Braford heifers to 275c/kg, reaching a top of $1,196 to average $1,196. RH, MR & FL Miller, North Kooringa, Roma sold Angus heifers to 272c/kg, reaching a top of $1,163 to average $721. Henrick Cattle Co, Dakota, Roma sold Angus cross heifers to 272c/kg, reaching a top of $637 to average $516. Col H Thompson, Shadowlands, Wallumbilla sold Charolais cross heifers to 270c/kg, reaching a top of $1,201 to average $871. GC & JA Peck, Yanco, Surat sold Charbray cross heifers to 270c/kg, reaching a top of $805 to average $738. BM & ND Bauer, Arlington, Augathella sold Simmental heifers to 270c/kg, reaching a top of $660 to average $423. West Family Pty, Loomeah, Roma sold Hereford cross heifers to 266c/kg, reaching a top of $932 to average $828. DT & KA York Family Trust, Wattle Park, Wallumbilla sold Simbrah cross heifers to 262c/kg, reaching a top of $986 to average $900. Cows in the 300-400kg range reached 227c/kg and averaged 180c/kg, while cows in the 400kg-500kg range reached 256c/kg and averaged 210c/kg. Cows over 500kg topped at 255c/kg, averaging 238c/kg. Pimlico Pty Ltd, Glenmorgan sold Charolais cows to 241c/kg, reaching a top of $1,350 to average $1,187.